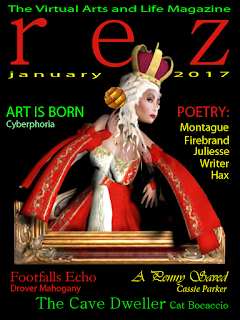 ﻿rez Magazine rings in the new year with an unusually stellar collection of prose and poetry this month from some of the most gifted writers on the grid. And from the look of it, this trend is sure to continue for the balance of the year. We begin 2017 with the monthly reprinting of select pages from Molly Bloom’s classic 2017 calendar, The Queen is Not Amused. As we did earlier with Bryn Oh’s 2015 calendar, each month we’ll excerpt a month from Molly’s hilarious and always original collection of 3-D motifs. As for literature, Cyberphoria is back with this month’s lead story, Art is Born, which opens with a quote from Art Blue: “If you control time, you control knowledge.” If going back to Victorian England is in a sense controlling time, then we have Cassie Parker to thank for that. She not only illuminates the LEA grant process for eager artists and even more eager audiences, but also lifts the curtain on TerpsiCorps’ own upcoming LEA installation, which will bring back to life the illustrious world of Penny Dreadfuls. With a single word “Hope,” Huckleberry Hax exquisitely describes how we’ve wrestled with the term over the past eight years. And what issue would be complete without one of Cat Boccaccio’s amazing short short fiction pieces. This month’s The Cave Dweller is an eerie glimpse into the world of solitary confinement. With no apologies to Disney, Flint Firebrand’s Frozen brings a wintry chill to our pages, as you can close your eyes and hear the ice cracking beneath your feet. I Cried a Tear on a Cornflake is DonJuan Writer’s epic poem about the devastation of a house fire and some of the surprising things that are forgotten in the damage assessment. Drover Mahogany’s third installment of his beautiful and insightful introspections, Footfalls Echo, is about learning – in this case, coaxing out the mysteries of the ancient Chinese board game, Go, with his devoted and always bewildered pupil. Our own Jullianna Juliesse dazzles us again with her vision, telescoping into the heavens and bringing us back down to earth with the pigeons in Bryant Park. And finally, newcomer Coquette Montague provides an apt close to our January issue with her examination of the puzzling intricacies of virtual romance. We look forward to hearing from Coquette again soon. 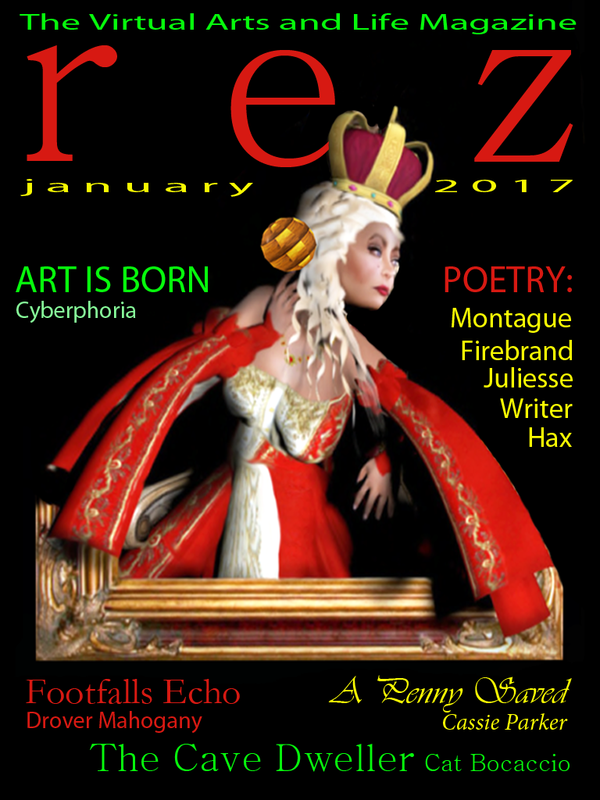 As we like to say at rez, if you only have time to read one thing this month, read rez. Enjoy!